The end of gasoline-powered cars is nigh. Soonish. Sales of electric vehicles doubled last year while the overall market stagnated. China and California led the charge. The internal combustion engine still dominates, but demographics, governance and economics suggest that dynamic is not far from breaking hard. 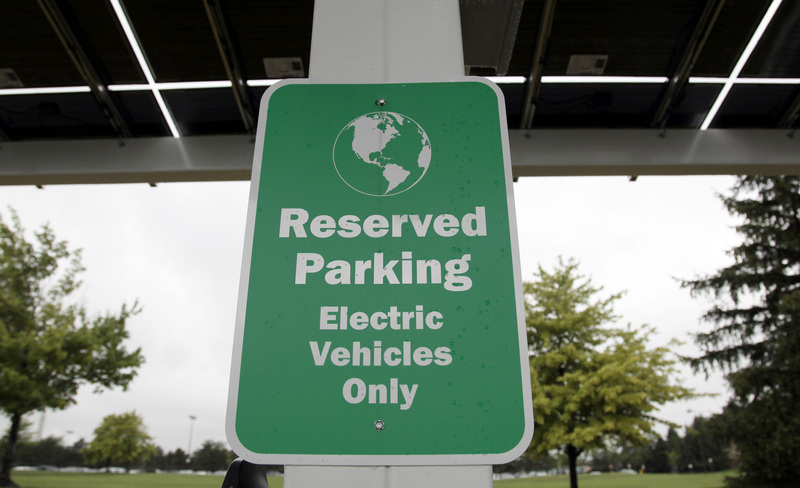 A reserved parking sign for electric vehicles is displayed at the solar-powered electric charging station designed by Sunlogics in the parking lot of General Motors Co's assembly plant in Hamtramck, Michigan August 9, 2011. About 2.1 million electric vehicles were sold worldwide last year, according to a report earlier this month by Germany’s Center of Automotive Management. There were 1.3 million new e-vehicle registrations in China according to the report. Bloomberg NEF estimated there were 1.1 million electric vehicles sold in 2017. The China Association of Automobile Manufacturers said in December it estimates 28 million vehicles will be sold in the country in 2019, which is roughly the same as 2018.